January 22, 2012: The 49ers fans won the Tempt Destiny billboard of choice by a narrow 53 votes beating out the Ravens fans. However, the 49ers team did not win their conference championship game so the billboard of chance option goes to the Giants since they had the most votes of the two SB bound teams*. 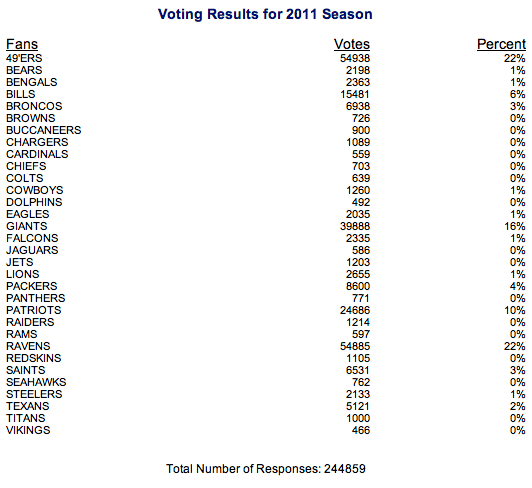 These are the final results of the top four totals for the 2011 season. January 23, 2012: The NY Giants organization had respectfully declined the Tempt Destiny billboard gift and advised that their decision is final. Since the Giants organization has decline this gift of support from their fans, we did not create a Tempt Destiny billboard for the 2011 season. When the NY Giants organization respectfully declined the billboard gift from their fans, this event provided an opportunity to address the concept of superstition. FACT: As of January 23, 2012, the NYG have never won a SB without a Tempt Destiny billboard. SUPERSTITION: The Tempt Destiny billboard is a good luck charm for the NYG when they have it and a jinx when they don't. Prior to SB XLVI, they have won three SBs with it and lost one SB without it. To put this superstitious notion to the test, I made a prediction (hypothesis) that based on a false dichotomy of the team's decision to negate their fans support that it was unlikely the NYG would win SB XLVI. I used the mathematics of the Cartesian coordinate system in reverse order (commutative law) for this prediction. In other words, I used indirect correlation to predict a direct correlation of the outcome. This is no different than wearing your "lucky" football jersey to guarantee your team's victory or physicists using proton collisions to predict a 'discovery''. Originally, I thought that the Tempt Destiny billboard phenomenon was about luck until the 3rd billboard event took place. I then had evidence that this was about predetermined events, i.e., destiny. However, I did not have evidence to prove that this was not about superstition. The evidence has shown that superstition is nothing more than the entertainment of ignorance of first cause or inference of correlation without a direct causal relationship, i.e., conjecture. But there still remains this one crucial detail, a selection was still made to support the NY Giant's SB XLVI quest unlike what happen when they went to SB XXXV and lost. This means that in order to address all causal possibilities relating to this phenomenon, the NY Giants will need to win a SB without a billboard selection to remove the notion of indirect correlation (superstition). In other words, the billboards themselves and the events that followed, completion/non-completion of the artwork, would never have taken place without a selection first being made. NOTE: Beginning with the 2013 football season, it will be up to teams themselves to commission the next Tempt Destiny billboard to see if the 3-for-3 billboard phenomenon can be extended for a team other than the NY Giants. Since SB XLIV, we have been doing two different types of Tempt Destiny billboards, one of choice (team with the most votes) and one of chance (SB bound team with the most votes). If the team with the most votes does not make it to the SB, then we will do the next TD billboard for the team that has the most votes of the two competing SB teams. (see press release).